Enjoy two Big Island experiences with this combo tour that includes a submarine ride and luau. Get a look at Hawaii’s underwater world as you venture below the surface of the sea to observe the fish and other marine life that live around the coral reef. Then soak up a bit of Hawaiian culture at the Royal Kona Resort Luau, where you’ll enjoy food and musical entertainment. The people that introduced us to the boat and sub were amazing. Very friendly and fun. We enjoyed a no ear penalty to be down at 100' and enjoyed the visual experience. What a wonderful experience! The staff were very courteous and helpful. Our tour guide, Jason, was very knowledgeable and delightfully funny. Having the opportunity to view the beautiful and varied marine life was fascinating and beautiful. I would highly recommend this tour. 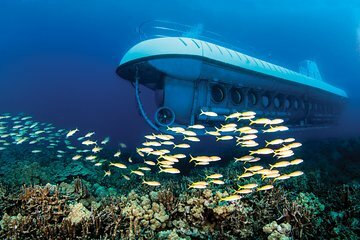 The submarine is a great way to see the fish and not get wet. The beach near the pier is also good for swimming. Kona is very laid back without all the high rise buildings. One long street full of souvenir shops and eating places. We stayed at Kona Resort and enjoyed the Luau. We got to meet the entertainers after the show and had our photos taken with them. The food, entertainment, open bar was exceptional. I am a vegetarian and there was food for me to eat too. I highly recommend this tour and the Kona Resort is also a great place to stay. There is a lot to see and do on the Big Island. This was absolutely awesome. The crew was very professional and made you feel at ease, explaining at all times what was happening as you submerged. On the other hand, the man who led the excursion was very, very funny in addition to being extremely knowledgeable about what we were seeing. His description of the longest and second longest fish species in Hawaii was hilarious. The seating was comfortable and the portholes were large enough to see and take photos of all the fish that swam by. I highly recommend this trip! The submarine tour was good. Enjoyed Tomo's patter while many chatted over it. He was a consummate gentlemen. His stats about 40 of the Great Barrier Reef damaged or destroyed by man-made global warming are highly eggerated by global warming warmist high priests. No Matter. The submarine trip was fine but the luau was impossible to find and in my car I had to use a map because my GPS and maps couldn't find itl Kailua Kona is only good for those on a tour or hand-guided group. No parking, no signage, no help, nothing!!!!! The submarine part was awesome!! Really a unique experience. But the luau wasn't that great, performance was ok, the guy dancing with fire is super cool, but food was terrible. If you don't swim or snorkel, this is the way to go. guides were very informative they knew all the fish, was a great time, recommend it highly.